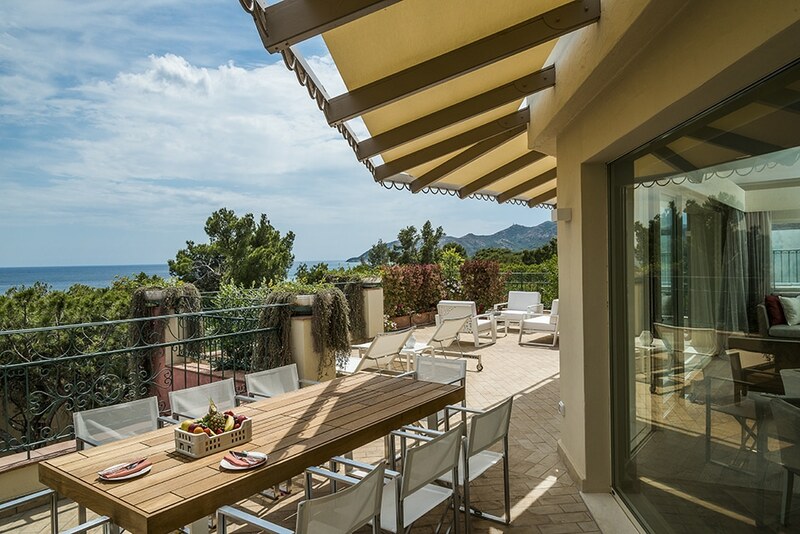 Book direct from www.designholidaysfortevillage.co.uk for Forte Village Sardinia and get unbeatable rates at the Forte Village in Sardinia , we are so confident of this that we will offer a price promise that we will never be beaten on price! Our Forte Village Holidays include half board accommodation at the Forte Village, for more information contact our Forte Village Reservations team on 01444 87 22 14. Due to our fabulous relationship with the Forte Village we are pleased to offer the best possible rates at the Hotel Castello at Forte Village in Sardinia. * 2 Children sharing with parents get FREE PLACES on selected accommodation – exclusive to www.designholidaysfortevillage.co.uk. 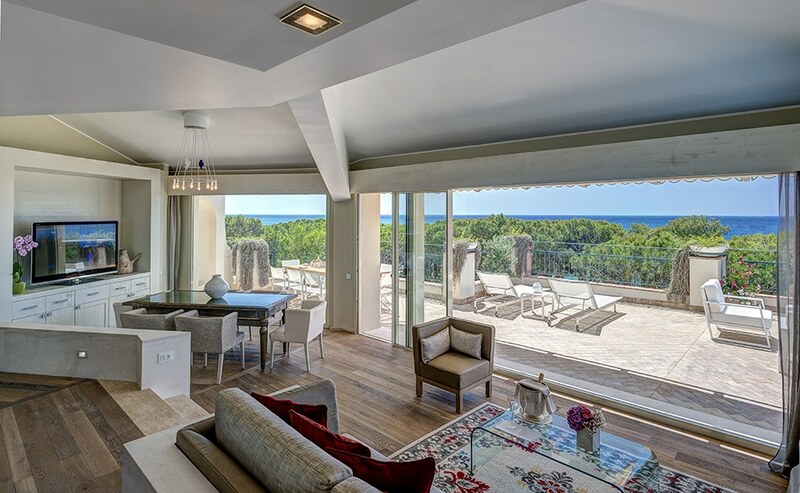 Our fantastic per person packages at the Forte Village in Sardinia include Half Board (with wine in selected restaurants) Accommodation, Children’s Club. 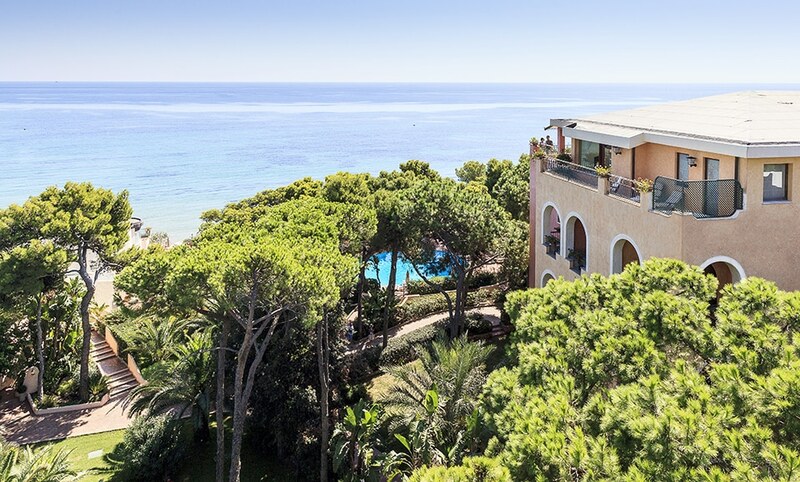 Renowned for its peaceful, relaxing atmosphere and recognised as one of the best hotels on the Mediterranean, the Hotel Castello is situated near the seaside in a secluded corner of the Forte Village. 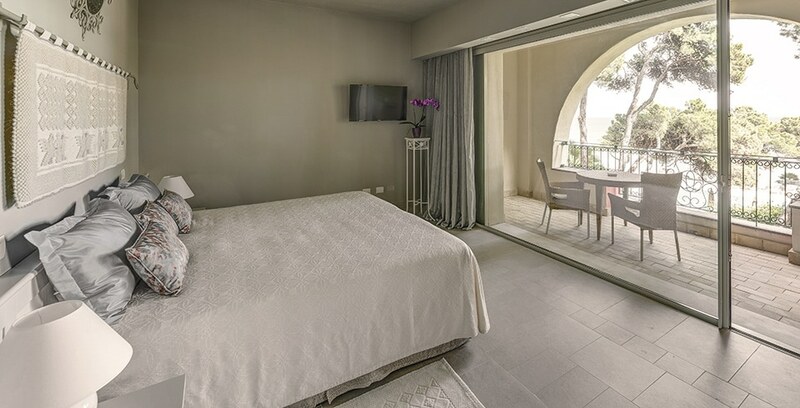 There are eight different types of rooms at the Hotel Castello, decorated in characteristically Sardinian style; Superior Pineta, Superior Garden, Superior Mare, Luxury B, Luxury A and, on the fourth floor overlooking an enchanting landscape, Luxury Roof, Junior Suite, and Suite. All 175 rooms / suites at the Hotel Castello feature private bathroom with tub and shower (some also have a separate shower), air conditioning and heating, direct dial telephone, colour television with satellite channels, fridge bar and safe. A baby’s crib or third bed can be provided upon request. There are also a number of adjoining rooms. The Royal Suite at the Hotel Castello , on the 5th floor of the Hotel Castello, gives rise to a world of beauty with its private pool and spectacular view. Room with king-sized or two beds and a balcony overlooking the pine woods. 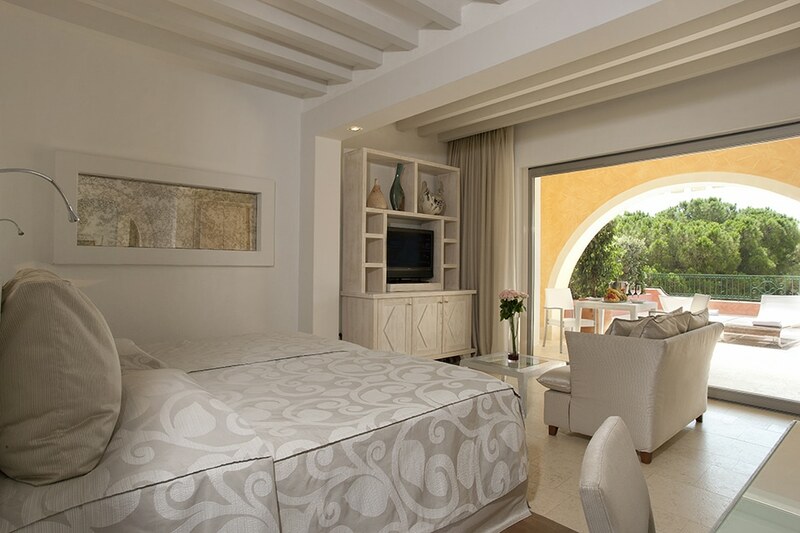 This room at the Hotal Castello has a king-sized or two beds and a balcony overlooking the garden. 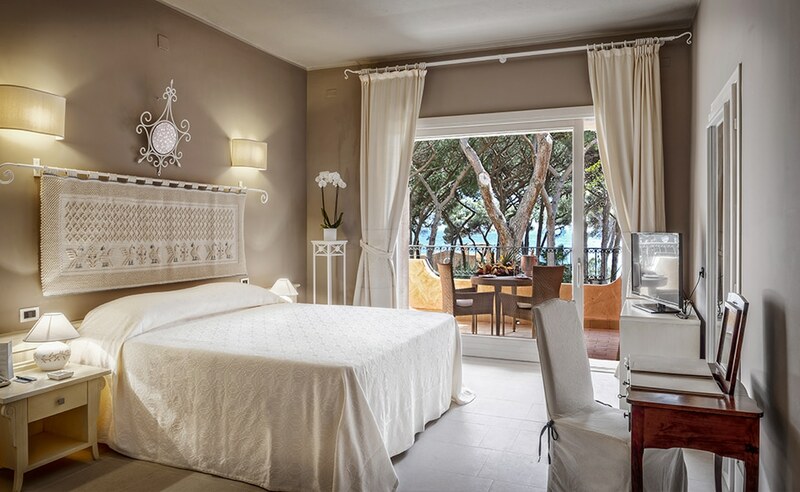 This room at the Hotal Castello has a king-sized or two beds and a balcony overlooking the sea. 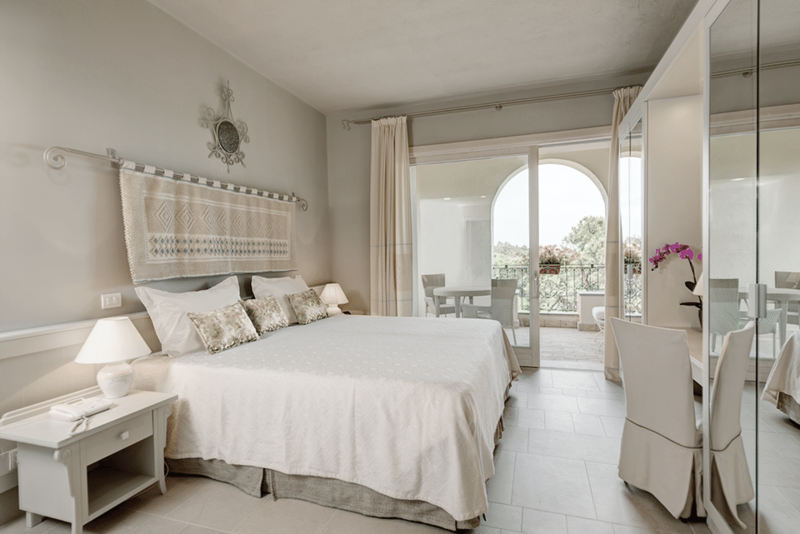 The softly refurbished rooms at the Hotel Castello offer more spacious than the Superior Mare rooms, with balconies facing the sea. Rooms contain a divan bed that can be converted into a third bed, ideal for families of two adults and one child. This Hotel Castello room is very spacious, comfortable room with two king-sized beds, sitting room area (open plan) and terrace overlooking the sea. Situated on the 4th floor. Covering 28 sq m, these twin or double ground floor rooms open out onto a private patio. An extra bed or a cot can be provided on request. With around 30 sq m of interior space and a 27 sq m terrace, these rooms are spacious and comfortable. 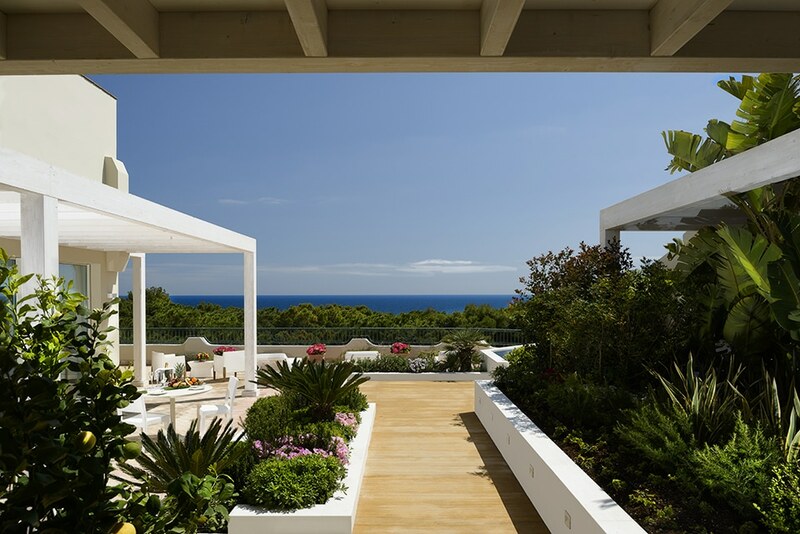 Each room has two queen size beds or a double bed, a bathroom with bathtub or shower and a large terrace facing the sea. Some bathrooms have whirlpool tubs and some have chromotherapy showers. An extra bed or a cot can be provided on request and some rooms are adjoining. 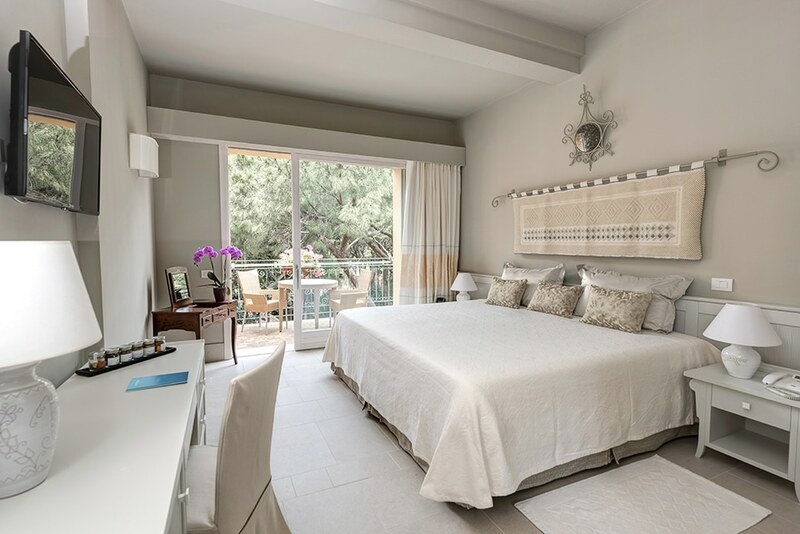 Extending over 35 sq m, this accommodation has a large bedroom with two double or queen size beds set above a small living area opening onto a 33 sq m terrace facing the sea. The bedrooms have a bathroom with bathtub or whirlpool bath and a chromotherapy shower. An additional bed or cot can be provided on request and some rooms are adjoining. Hotel Castello Suites, on the Hotel Castello’s fourth floor, the luxury and simplicity of Sardinian furniture, the comfort and intimacy of its five exclusive rooms, come together in the Presidential Suite. Both the bedroom and living room lead onto a spacious terrace, where there is a large jacuzzi whirlpool bath and attractive wood furniture, looking out onto one of the most reserved corners of the resort. 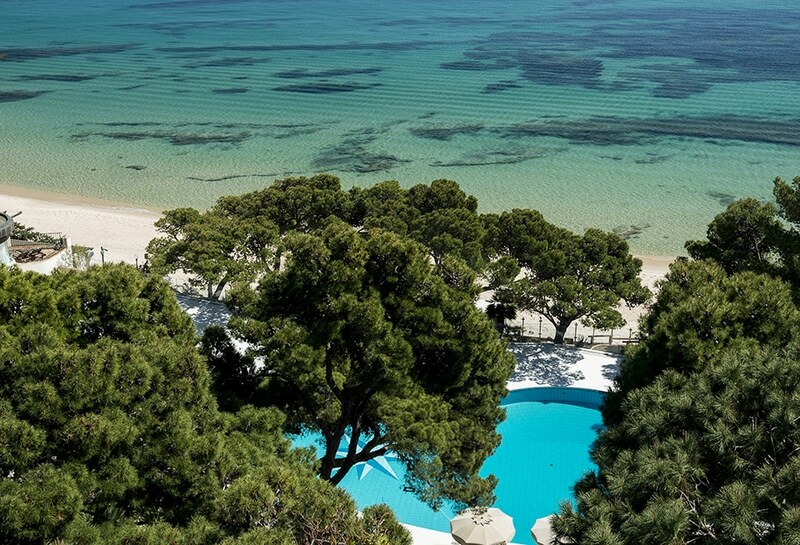 On the same floor, at the end of the east and west wings of the Hotel Castello, the light colours and spaciousness of the Nora / Junior / Bithia Suites are nestled in a splendid natural setting, with pine woods and a stupendous view of the sea. The Nora Suite is linked internally and via the terrace (which also has a second whirlpool bath) with an adjoining ‘Luxury Roof’ room. 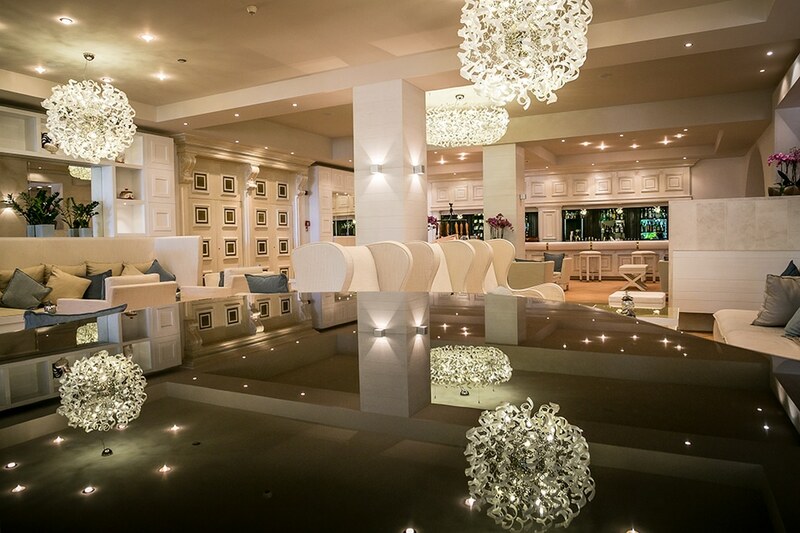 Hotel Castello is as serene as it is majestic. 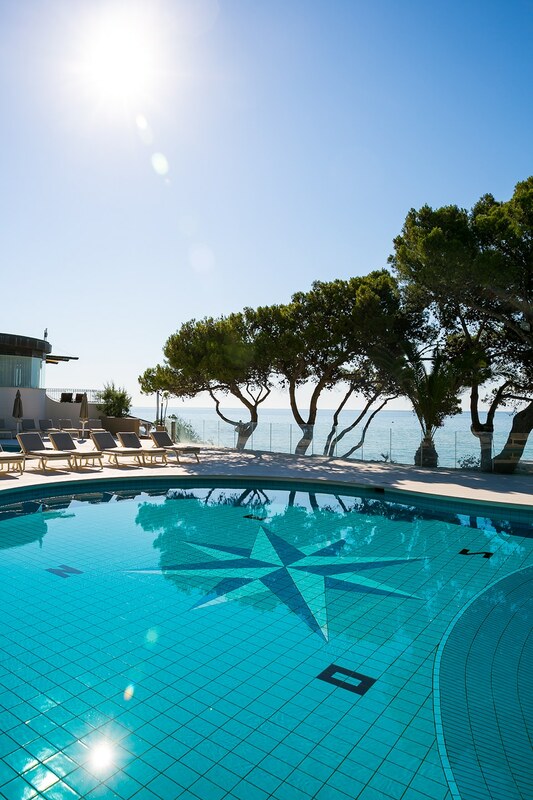 Sitting in an undisturbed part of the Forte Village, the hotel comprises different types of suites and rooms.On the fifth floor of thehotel, The Royal Suite has its own private pool and allows you to see much of the dreamy Cagliari landscape. Decorated in typical Sardinian style, all 175 rooms at Hotel Castello have air cooling systems and heating, direct dial telephone, fridge-bar, satellite TV, safe, and free Wi-Fi for business travellers. Hotel Castello rooms are divided into Superior, Executive, Deluxe, and Prestige types. All Superior rooms come with a king-sized bed or twin beds and a balcony which commands lovely views of the pine woods (Superior Room), the garden (Superior Garden), and the sea (Superior Mare). Our Executive rooms (Executive Mare Plus and Executive Deluxe Mare) have all the features of the Superior Mare but are larger. The Deluxe Room Patiohas twin rooms and a private patio. 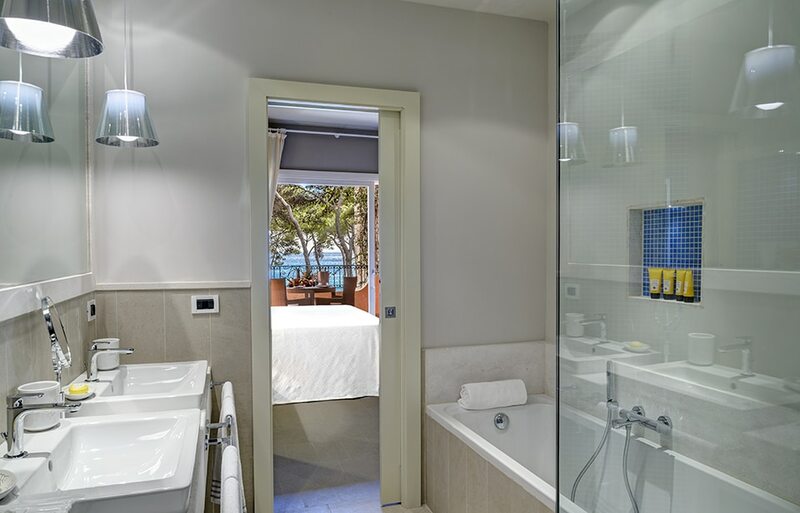 With a terrace covering 27 square meters and a 30 square meters interior, the Prestige Room comes with a double bed or two queen-sized beds, a terrace overlooking the sea, and a bathroom with whirlpool tub or a chromotherapy shower. The Prestige Plus Roomspans35 square meters and comes with similar arrangements as the Prestige Room, with an added feature of a small parlour. Presidential Suite: Situated on the hotel’s fourth floor, the Presidential Suite is made up of five premier rooms lavishly decorated with traditional Sardinian décor. 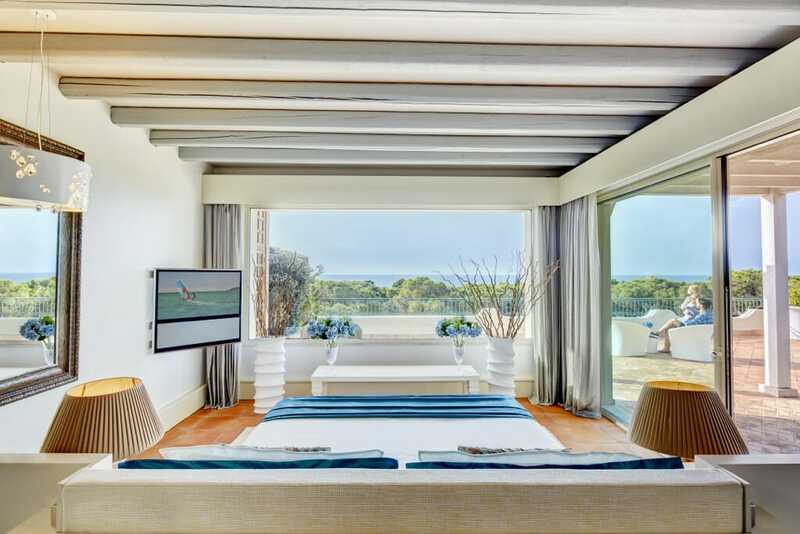 The living area and bedroom, open up into a large terrace looking over one of the quietest areas of the holiday village. 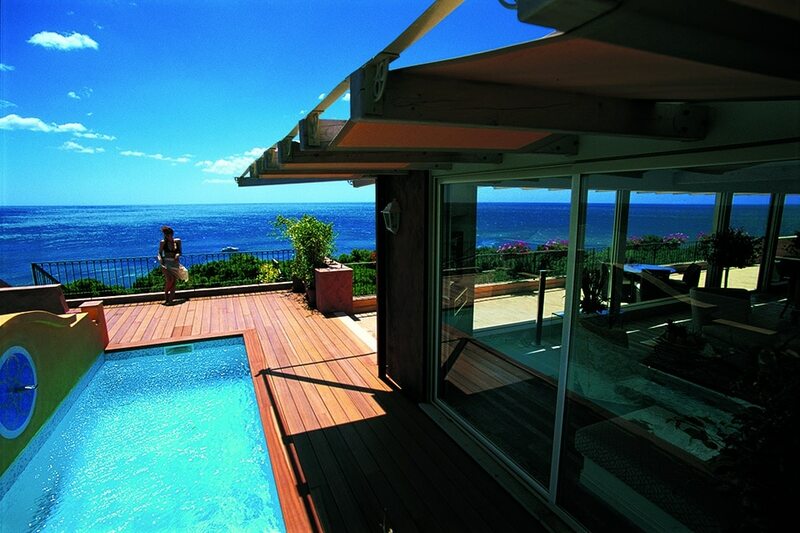 The terrace features exquisite wooden furniture and a massive Jacuzzi. Nora Suite: In the easternmost and westernmost sections of the hotel, sit the Nora Suites. 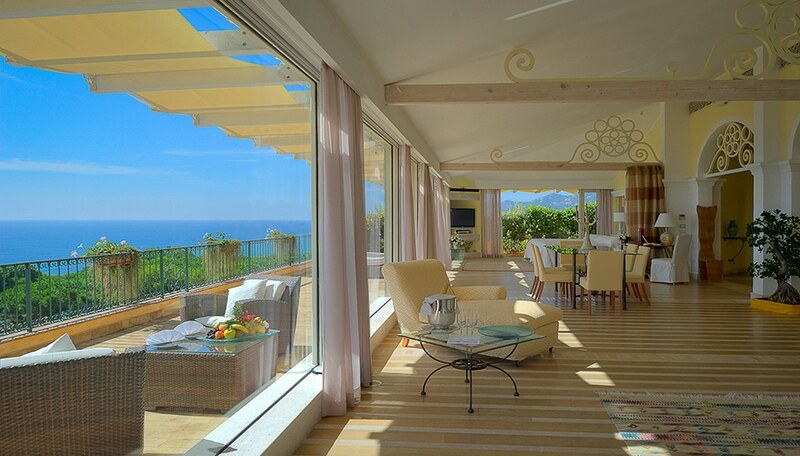 These airy suites are surrounded by nature’s goodness including pine woods and stunning views of the sea. 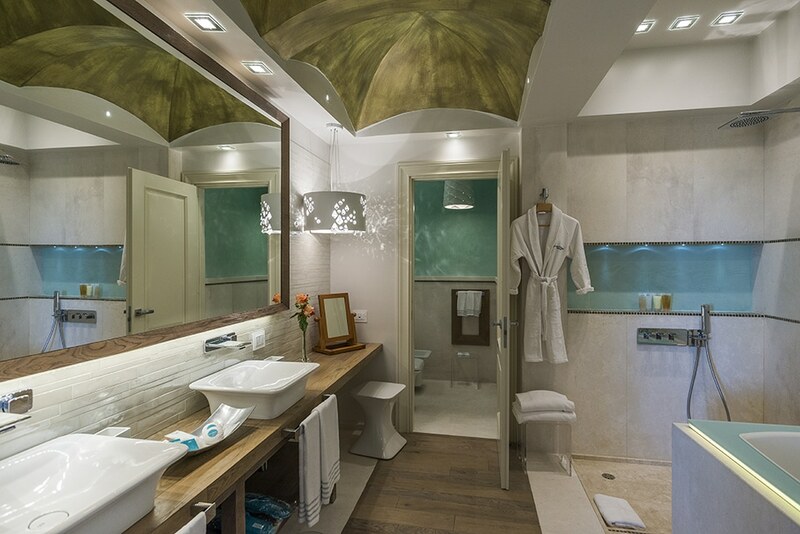 TheNora Suite has a terrace with a whirlpool bath and a connected ‘Luxury Roof’ room. Not to worry, you’ll find ideal rates for a grand experience when lodging at Hotel Castello, with the option of half board. For 2 adults staying for a week, prices start from £2954. Our half board packages include wine in specific restaurants. We have special packages for children, including free places in specific accommodations for 2 children sharing with their parents, and a Children’s Club. Hotel Castellois 49 minutes from the Cagliari Elmas Airport. From the airport, you’ll take Arrivi to Via dei Trasvolatori/SS391 for 3 minutes and 700 m and join E25 to Strada Statale 195 Sulcitana in Capoterra for 20 minutes and 23.5 km. At the roundabout, you’ll take the 2nd exit and stay on Strada Statale 195 Sulcitana for 9 minutes and 10.4 km before you get to another roundabout and continue straight to stay on Strada Statale 195 Sulcitana for 13 minutes and 13.9 km. 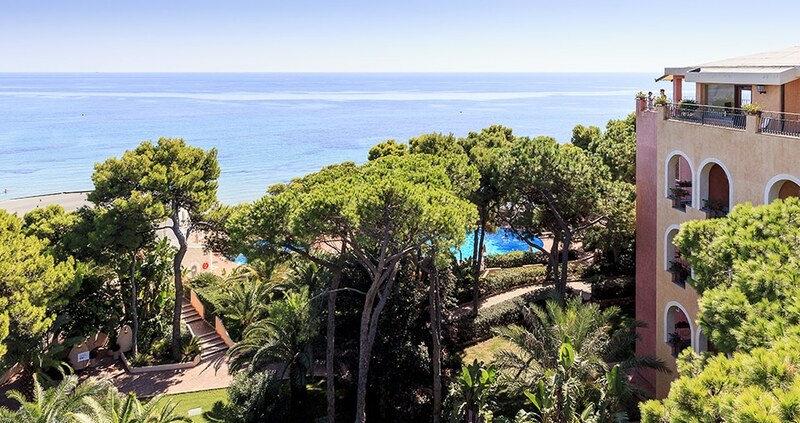 Finally, you’ll take Viale delle Nereidi for 4 minutes and 800 meters to Forte Village Resort. Get the best possible prices when you book directly from www.designholidaysfortevillage.co.uk. You may also call (+ 44) 01444 87 22 14. We know you’ll find our prices well suited for you.